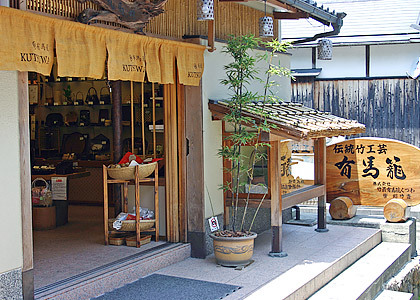 Arima Kutsuwa is a production and sales shop that carries on the traditional craft of Arimakago which dates back to the Azuchi Momoyama Period. Beginning with flower baskets for use in traditional Japanese tea ceremony and flower arranging, we produce a wide variety of bamboo crafted handbags for everyday use and cutlery. Moreover, we have an auxiliary factory where you can observe our craftsmen as they work.